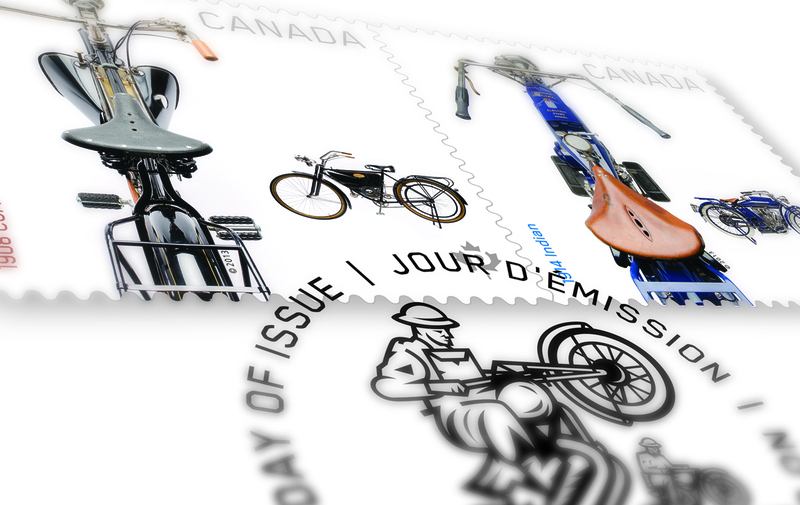 On June 5, 2013, with Canada Post’s issue of two stamps commemorating Canadian motorcycles, a long journey will reach its completion, a pit stop at a major milestone. 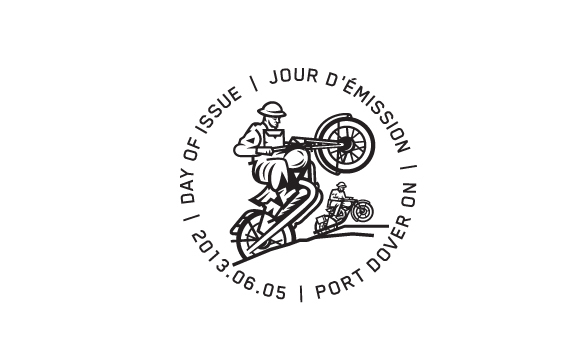 Designer Matt Warburton’s life-long love of stamp design have joined in a symbiotic journey with his other passion, motorcycles. As a child in 1972, Matt’s father sent him to the post office to pick up a corner block of the earth sciences series. Intrigued by their beautiful simplicity and clean, strong design, Matt started to collect stamps, inadvertently igniting an interest in graphic design. This pathway reached a poetic point when years later, Matt became a production designer at Gottschalk + Ash, the firm that designed those very stamps that had caught his childhood imagination. Matt’s father also transferred his love of motorcycles to his son. 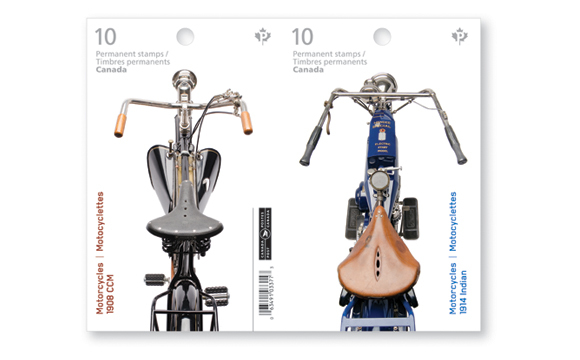 Motorcycles are iconic to many Canadians who frequently suggest Canada Post feature them. 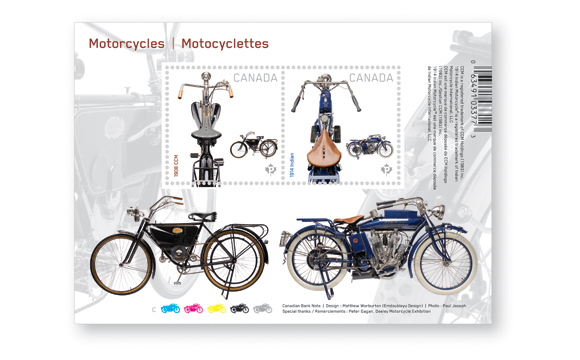 The Canada Post Stamp Advisory Committee asked Matt to prepare a research document on Canadian motorcycles to determine their suitability for a postage stamp. Warburton had owned a 1975 Can-Am 250 TNT so he knew of at least one brand with a long Canadian history, and his research led him to discover others. In fact the history is so rich, there will be a postage stamp series issued in 2013 and 2014. The stamps’ design echoes the clean, simple type and graphics Matt saw in those earth sciences stamps from 1972. The new stamps display the large top view of the machines contrasting with the smaller side view profiles. They highlight the stark simplicity of the bikes, focusing on the view seen by a rider. 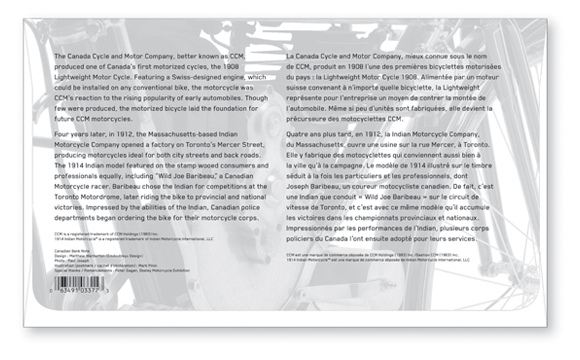 Collateral materials, the first day covers (OFDC), booklets and souvenir sheets bring in other views of the engine details and bodywork, design elements which have changed surprisingly little from the first motorized bicycles like the 1908 CCM through to the 1914 Indian, whose V-twin engine, running gear shape and profile are successfully mimicked by manufacturers around the world such as Harley-Davidson and Yamaha. 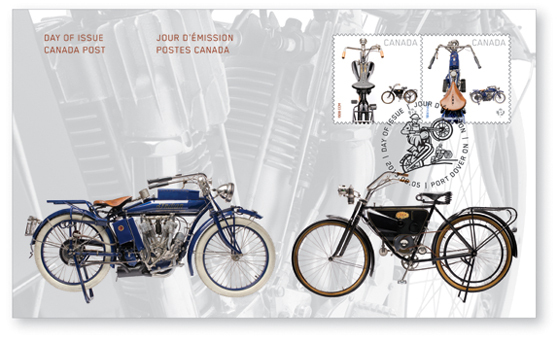 “All motorcycles featured on the stamps were produced in Canada and will resonate with enthusiasts and enlighten the general public. They are all uniquely Canadian and have not appeared on stamps from any other country,” says Warburton. The 1908 CCM is an excellent example of one of the earliest motorcycles produced simultaneously around the world. It used a readily available engine produced in Switzerland and parts like brakes and lights sourced from England. But with Canadian designed and built frame and bodywork, the motorcycle itself was manufactured and assembled in Canada. The 1914 Indian was basically the same as the US model but manufactured in Toronto (to circumvent import tariffs and taxes) and painted blue to differentiate them from the American models. Well known as a classic American brand, most motorcyclists will not be aware that they were also built in Canada. 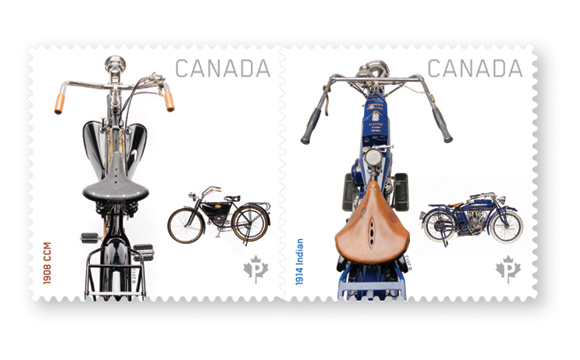 Both the examples featured on the stamps were from the personal collection of Peter Gagan of Qualicum Beach, BC and were photographed at the Trev Deeley Motorcycle Exhibition in Burnaby, BC. The photoshoot was a thrill for Matt who loved the engineering details, and photographer Paul Joseph of Vancouver who captured the shapes and forms of the machines in evocative artistry. Vancouver illustrator Mark Pilon’s postmark is based on a classic Canadian poster from 1940 by Eric Aldwinkle and Albert Cloutier. 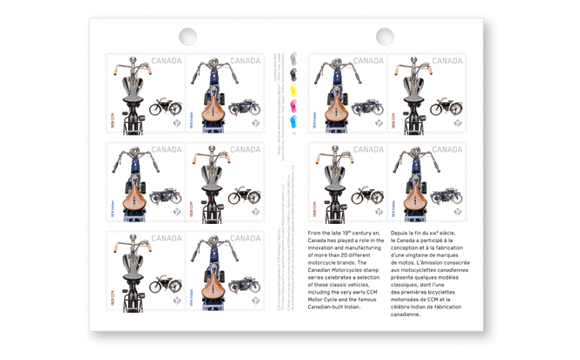 Like any good road trip, this motorcycle design journey never really ends but is reaching a significant milestone as Matt and his Dad won’t even be in Canada when these stamps are issued. They’ll be joining thousands of other motorcycle enthusiasts on the Isle of Man for the annual TT races, as so many have done since 1907 (Matt’s dad frequently attended in the 1950s). They’ll sup ale at a roadside pub as the riders whiz by, inches from stone roadside walls at unimaginable speeds. Just a rider, a throttle hand, two wheels and an engine. Click here to order the stamps.